Airship Italia was a semi-rigid airship belonging to the Italian Air Force. It was used by Italian engineer and General Umberto Nobile in his second series of flights around the North Pole. It crashed in 1928, with one confirmed fatality from the crash, one fatality from exposure while awaiting rescue, and the death of six crew members who were trapped in the still-airborne envelope. At the end of the rescue operations there were 17 dead (crew and rescuers). Italia was an N-class semi-rigid airship, designation N-4. It was almost identical in design to the N-1 Norge but slightly larger in gas capacity. At the end of 1927, after much insistence, Nobile gained permission to use this airship for a new scientific expedition to the North Pole under the aegis of the Italian Geographic Society. He obtained strong assistance from the Navy and secured the necessary funds from a financing private Committee of the City of Milan. Umberto Nobile – Expedition leader – Survived. Finn Malmgren – Swedish meteorologist and physicist – Died trekking for help. František Běhounek – Czechoslovak physicist – Survived. Aldo Pontremoli – Italian physicist (University of Milan) – Lost with envelope, never found. Ugo Lago – Journalist, Il Popolo d'Italia – Lost with envelope, never found. Francesco Tomaselli – Journalist (Royal Italian Army Alpini) – Not on final flight. Adalberto Mariano – Navigator (Royal Italian Navy) – Survived. Filippo Zappi – Navigator (Royal Italian Navy) – Survived. Alfredo Viglieri – Navigator/hydrographer (Royal Italian Navy) – Survived. Natale Cecioni – Elevator operator, chief technician – Survived. Giuseppe Biagi – Radio operator – Survived. Ettore Pedretti – Radio operator – Not on final flight. Felice Trojani – Elevator operator, aeronautical project engineer – Survived. Ettore Arduino – Chief engine mechanic – Lost with envelope, never found. Calisto Ciocca – Starboard engine mechanic – Lost with envelope, never found. Attilio Caratti – Port engine mechanic – Lost with envelope, never found. Vincenzo Pomella – Rear engine mechanic – Killed in the crash. Renato Alessandrini – Foreman rigger and helmsman – Lost with envelope, never found. Titina – Fox terrier belonging to Gen. Nobile, expedition mascot – Survived. Italia landed at Stolp in April 1928 before embarking on the polar flights. In this photograph, Nobile is seen with his dog Titina. At 01:15 on 15 April 1928, Italia took off from the base at Milano and headed for the Arctic, stopping off at a German airship hangar at Stolp (now Słupsk) in Pomerania, and the airship mast at Vadsø in Norway. With twenty personnel on board, and a payload of 17,000 pounds (7,700 kg) of fuel and supplies, the initial journey to Stolp in Germany took thirty hours through a variety of bad weather conditions. Near Trieste, a wind gust damaged one of the tail fins. Later, in the Sudetes, the airship faced severe hailstorms and narrowly escaped lightning strikes. On arrival at Stolp, at 07:15 on 16 April, inspection revealed hail damage to the propellers and envelope, and severe tail fin damage. All of the ballast and most of the fuel had been used fighting the wind. Repairs took ten days, and the required parts and technicians had to be sent from Italy. Takeoff from Stolp was further delayed by bad weather, but Italia set off for Norway at 03:28 on 3 May 1928; eight hours later, escorted by Swedish naval planes, she passed over Stockholm. Crewmember Finn Malmgren spotted his house from the air and the airship descended to drop a letter to his mother. Bad weather forced Italia east over Finland; she passed over Rovaniemi at 01:49 on 4 May, reaching the mooring mast at Vadsø later that day. While the airship was moored without difficulty, blizzard conditions and heavy rain kept the crew in a state of constant anxiety but caused only minor structural damage. As soon as the weather permitted, Italia took off for Ny-Ålesund (Kings Bay) at 20:34 on 5 May, and by 05:30 the following day, had passed the meteorological station on Bear Island, but ran into high winds shortly afterwards, also suffering an engine failure. By 12:00 on 6 May, Italia had reached Kings Bay where the support ship Città di Milano was anchored under the command of Captain Giuseppe Romagna Manoja. Nobile planned three flights for the polar expedition, each exploring a different area of the Arctic, with a return to Kings Bay between flights. Once the necessary engine and structural repairs had been completed, the first flight departed from Kings Bay on 11 May 1928. Italia was forced to turn back eight hours into the flight because of thick ice forming on the envelope, as well as fraying of the control cables due to the extreme conditions. The second flight left at 13:20 on 15 May and lasted for sixty hours. In contrast to the first flight, the weather conditions were excellent this time and visibility was perfect. Valuable meteorological, magnetic, and geographic data were gathered in a 2,500-mile (4,000 km) flight to the hitherto uncharted Nicholas II Land and back. Malmgren carried out weather and ice observations, while Pontremoli and Běhounek took measurements of magnetic phenomena and radioactivity. The airship returned safely to base at Kings Bay in the early hours of 18 May. The third flight started on the morning of 23 May; following a route along the Greenland coast, with the assistance of strong tailwinds, Italia reached the North Pole nineteen hours later, at 00:24 on 24 May. Nobile had prepared a winch, an inflatable raft, and survival packs (which turned out to be providential) with the intention of lowering some of the scientists onto the ice, but the wind made this task impossible. Instead, they circled the pole, making observations, and at 01:20 they dropped onto the ice the Italian and Milanese colours, as well as a wooden cross presented by the Pope and a religious medal from the citizens of Forlì, during a short ceremony. The Italia started back to base at 02:20 on 24 May. The same tail wind that had helped Italia to the Pole now impeded her progress. Nobile calculated that the return journey would take 40 hours, and had discussed their options with Dr Malmgren in the hours before their arrival at the Pole. Nobile considered a trans-polar route to Mackenzie Bay in Canada but, according to Nobile, Malmgren advised a return to Kings Bay, predicting lessening winds on their return trip. On the other hand, Malmgren anticipated a head wind all the way if the Canadian route was attempted. No doubt the prospect of a forced landing in the Canadian wilderness was unpalatable to both men, as it would mean the end of the expedition. Travelling directly south on a heading for Kings Bay, after 24 hours of increasing head winds and thick mist, the Italia was only halfway back to base. The airship struggled to gain ground and break through to the zone of calmer winds which expedition meteorologist, Finn Malmgren, predicted was just ahead. Ice was forming on the propellers and shooting off into the envelope, which necessitated running repairs. Engine speed was increased but with little effect, except for a doubling of fuel consumption. Dr Běhounek, who was in charge of the compass, started to report variations in course of up to 30 degrees, and the elevator man Cecioni had similar problems maintaining control. By 07:30 on 25 May, Nobile, who had been awake for over 48 hours, knew that the situation was critical and Giuseppe Biagi, the wireless operator, sent out the message: "If I don't answer, I have good reason". By dead reckoning, Nobile estimated his position to be 100 miles (160 km) northeast of Moffen Island; instead they were 200 miles (320 km) east of the island. The first critical incident occurred at 9:25am on 25 May, when the elevator control jammed in the downward position while the ship was travelling at less than 1,000 feet (300 metres) altitude. All engines were stopped and the Italia began to rise again after it had dropped to within 300 feet (91 metres) of the jagged ice pack. The airship was allowed to continue rising to 3,000 feet (910 metres) and above the cloud layer into bright sunlight for 30 minutes. After two engines were restarted, the ship descended to 1,000 feet (300 metres) with no apparent ill effect, with the headwind appearing to decrease slightly allowing an airspeed of 30 mph. Malmgren took the helm with Zappi supervising him, and Cecioni continued to operate the elevators. At 10:25, the ship was noticed to be tail-heavy and falling at a rate of 2 feet per second (0.61 m/s). Nobile ordered full elevators and emergency power, but although the nose rose to an upward angle of 21 degrees, the descent continued. Nobile ordered foreman rigger Renato Alessandrini to the tail of the envelope to check the automatic gas valves. Shortly afterwards, realising that a crash was unavoidable, Nobile ordered a full stop and the cutting of electrical power to prevent a fire on impact, however the port engine engineer failed to notice the order and the ship began to bank. At the same time, Nobile ordered Cecioni to dump the ballast chain, but was unable to carry out the order in time owing to the steep angle of the floor and the secure way in which the chain was lashed. Seconds later, the airship's control cabin hit the jagged ice and smashed open. Suddenly relieved of the weight of the gondola, the envelope of the ship began to rise, with a gaping tear in the keel and part of one cabin wall still attached. Nine survivors (including Nobile's fox terrier) and one fatality were left on the ice. Six more crew were trapped in the still drifting airship envelope which, along with the crew members on board, has never been found. The position of the crash was close to 81°14′N 28°14′E﻿ / ﻿81.233°N 28.233°E﻿ / 81.233; 28.233, approximately 120 km (75 mi) northeast of Nordaustlandet, Svalbard. The drifting sea ice later took the survivors towards Foyn and Broch islands. Cecioni was hurled out of the ruptured cabin into a mound of ice, injuring both of his legs. As he looked up he saw the envelope drifting above him, and Ciocca halfway out of the starboard engine car staring down in horror. Lago, Dr Pontremoli, and Alessandrini could also be seen in the torn opening where the companion way had been. Chief engine mechanic Ettore Arduino, with remarkable presence of mind, started throwing anything he could lay his hands on down to the men on the ice as he drifted slowly away with the envelope. These supplies, and the packs intended for the descent to the ice, helped to keep the survivors alive for their long ordeal. Arduino, and the five others, perished with the drifting airship envelope. Trojani, at the engine control signals, fared better, as he was hurled into soft snow and rolled before immediately jumping to his feet and cleaning the snow off his glasses, which had survived the crash unscathed. Viglieri and Mariano, standing next to the chart table, briefly saw the rear engine car about to strike the ice hard and then found themselves prostrate, but unharmed, in a mass of debris. Biagi, with no time to send out an SOS, grabbed the portable emergency radio and wrapped his arms around it trying to save it from damage. The impact on the ice had winded him, but he was still inside the wreck of the cabin when it came to rest. Nobile lay unconscious with a head wound, with Malmgren and Zappi nearby. Mariano, Běhounek, Trojani, and Viglieri were the first to rise to their feet, and they began to examine the others for injuries. Nobile gradually regained consciousness; he had a broken leg, right arm, and cracked rib, in addition to the wound on his head. Cecioni had two badly broken legs. Malmgren had an injured shoulder (possibly broken or dislocated) and was suspected, much later on, to have internal injuries to his kidney. Zappi had severe chest pains from suspected broken ribs. Almost immediately, the survivors were buoyed by the discovery of a waterproof bag containing chocolate, pemmican, a Colt revolver, ammunition and a flare gun. Biagi's shortwave radio was intact and he began searching round for material to construct a radio mast. He soon discovered the rear engine car smashed on the ice, and the body of Pomella, who appeared to have survived the impact and sat down on a block of ice, only to die minutes afterwards from a head injury. Despite this shock, Biagi was able to erect an antenna, and within a few hours began to send the first SOS signals from the stricken survivors. Nobile and Cecioni were placed together in a sleeping bag for warmth and spent the next few hours in semi-consciousness, while the others gathered what they could from the wreck. According to Nobile, Malmgren, who was in pain and suffering from guilt about his role in the crash, announced that he would drown himself and began to walk away from the crash site, but he stopped when sharply ordered to return by the General. Later the same day, Mariano had to disarm Malmgren when he found him walking away from the crash site with the loaded Colt revolver. Meanwhile, the uninjured men surveyed the ice pack, collecting supplies, and they chose a stable patch of ice to erect a 2.4 by 2.4 metres (8 ft × 8 ft) silk tent that they had recovered—this was to be their only shelter during the coming ordeal. They spent the day after the crash looking for more supplies amongst the wreckage. Navigational instruments and charts were recovered, allowing them to calculate the position of the crash site. They also calculated the quantity of rations per man: a scant 300 grams (11 oz) of food per day, mainly pemmican and chocolate, calculated for a 25-day stretch on the ice. Eventually 129 kilograms (284 lb) of food were recovered, extending the supply to 45 days. Finally, the crowded tent was dyed with red strips for improved visibility from the air, using dye marker bombs that had been on board the airship. Biagi continued to signal for help with his radio, but the connection with the support ship Città di Milano was long impeded due to the precarious conditions of operation of the field radio, the particular propagation of short waves, and the unscrupulous use of radio stations by journalists at the Italian base in Ny-Ålesund. The flyers had been equipped with many layers of woollen clothes and lambskin flight suits, but not all of them were fully dressed at the time of the crash and none had proper Arctic survival clothing. Land was sighted in the distance on 28 May, breaking the despondency of the survivors. Discussions began as to whether they should attempt a trek towards land and eventually it was decided that Malmgren, Zappi and Mariano would set off to try to summon help. On 29 May, Malmgren shot a polar bear that approached the crash site, augmenting the food supply with about 180 kilograms (400 lb) of fresh meat. On 25 May, Captain Romagna Manoja immediately asked for Norway's assistance through the Italian delegation of Oslo. He rented two whaling boats and embarked on a rescue cruise to the northeast coasts. An international rescue effort followed. Word also reached Roald Amundsen in Oslo, who immediately volunteered to start on a search mission. Almost every Arctic explorer of note offered assistance or money for the search, including the American Lincoln Ellsworth. In Italy, Arturo Mercanti, a former air force chief and friend of Nobile, requested that air force planes be sent to the Arctic to begin a search. The Italian Government authorised three sea planes to be used: a Dornier Wal, piloted by Luigi Penzo; a Dornier Wal, piloted by Ivo Ravazzoni; and a Savoia-Marchetti S.55, piloted by Lt. Col. Umberto Maddalena, who was the first rescuer to spot the "Red Tent" survivors on 20 June. Captain Gennaro Sora (of the Italian Army Alpini ski detachment) ran a heroic over-ice sled attempt from the Città di Milano support ship, while Matteoda and Albertini of the SUCAI (the University Section of the Italian Alpine Club) did the same from the Italian-hired ship Braganza. The lack of co-ordination meant that it took more than 48 days before all of the crash survivors (and the stranded would-be rescuers) were retrieved. Roald Amundsen was lost, presumed dead, flying to Spitsbergen in a French Latham sea plane piloted by René Guilbaud to take part in the operation. 25 May: Radio operator Biagi salvages the radio, constructs a radio mast and begins transmitting SOS. Captain of the support ship Città di Milano, Giuseppe Romagna Manoja, calls Norway for help through the Italian diplomatic delegation of Oslo. 26 May: At the request of Captain Romagna, the Norwegian whaler Hobby is hired by the Italian government. 27–30 May: The ship City of Milan makes a rescue cruise to the North Cape, but is forced to turn back due to the impossibility of tackling the pack ice, but Sucaini Gianni Albertini and Sergio Matteoda manage to land, with the guide Valdemar Kramer, and the Alpini Giuseppe Sandrini and Silvio Pedrotti, who start the search with dogs and sleds. 28 May: Captain Romagna also hires the Norwegian whaler Braganza. 29 May: The second radio telegraphist of the expedition, Ettore Pedretti, on board the City of Milan intercepts a fragment of message which may have been transmitted by Biagi, but not being certain he does not transcribe the message, which only later proves to be a genuine transmission. 30 May: The survivors are unable to establish radio contact because of weather conditions, the particular propagation of short waves and the unscrupulous use of the radio frequencies by journalists based in Ny-Ålesund. Malmgren, with navigators Mariano and Zappi, begin a trek toward land. 3 June: A Soviet amateur radio operator Nikolai Schmidt (ru) in Vokhma (ru) village hears the Italia SOS signals; he is not able to intercept the coordinates of the survivors, on the contrary he gives the wrong directions. 5 June: The Norwegian pilot Lützow-Holm makes the first flight in search of the Italia. In the ensuing weeks, pilots from Norway, Sweden, Finland, Russia and Italy make search and rescue flights. 9 June: Radio contact is established between the ice floe and the Città di Milano. The radio station of the ship, under the command of Captain Ugo Baccarani, intercepts the coordinates of the survivors and the search takes effect. 15/16 June: Malmgren collapses from exposure on the ice and asks to be left behind. His body has never been found. 18 June: Roald Amundsen and five others disappear on a flight to Spitsbergen to aid in the rescue operations. Captain Gennaro Sora of the Italian Alpini defies orders and sets off by sled with Arctic explorers Ludvig Varming and Sjef van Dongen to try to reach the crash zone. 20 June: Italian pilot Maddalena spots the survivors and drops supplies, many of which are smashed or useless. 22 June: Italian and Swedish pilots drop more supplies, this time successfully. 23 June: Swedish pilot Lundborg convinces Nobile to leave the ice floe first, but crashes his plane on the return for more survivors and is trapped with the others. Rescue operations are suspended pending the arrival of suitable light aircraft capable of landing on the ice. 6 July: Lundborg is picked up from the ice floe by his Swedish co-pilot Birger Schyberg in a light Cirrus Moth ski-biplane. Schyberg also intends to rescue the other five survivors (including Nobile's dog), but changing ice conditions lead him to change his mind after having brought Lundborg to safety. 11 July: Mariano and Zappi, still trekking across the ice, are spotted by aircraft from the Soviet icebreaker Krasin. Soviet pilot Boris Chukhnovsky makes an unsuccessful safety landing in his Junkers G 24 monoplane. 12 July: Krasin rescues Mariano and Zappi, but Malmgren has already been left behind almost four weeks prior. The five remaining Italia survivors are rescued by the icebreaker later the same day. Boris Chukhnovsky and his four crew are also rescued by the Krasin on its way back to Kings Bay. 13 July: Rescuers Sora and Van Dongen are rescued from Foynøya island by Finnish and Swedish aircraft. State owned Arctic schooner Gustav Holm from Kgl. Grønlandske Handel. Flying boat biplane Latham 47 "02" (from French Navy) pilot: René Guilbaud. Two small flying boats, Schreck type biplane (on board Strasbourg). Cruiser Strasbourg, oil supply vessel Durance, fishery inspection vessel Quentin Roosevelt and private expedition vessel Pourquoi Pas? Flying boat Savoia-Marchetti S.55 I-SAAT Santa Maria (from Italian Air Force) pilot: Maddalena. Flying boat Do15 Dornier Wal Marina II I-PLIF (from Italian Air Force) pilot: Penzo. Flying boat Do15 Dornier Wal Marina I I-XAAF (from Italian Air Force) pilot: Ravazzoni. (Marina I was stationed exclusively at Tromsø, Northern Norway searching for Amundsen). Two small flying boats, Macchi M.18 type biplane stationed at Citta di Milano and Braganza pilots: Penzo and Crosio. Cableship Citta di Milano and seal fishery vessels Hobby and Braganza. Norwegian trapper Waldemar Kræmer and four Alpini soldiers with a small boat searched the coast of Vestspitsbergen. Dog sledge team led by the Italian Alpini captain Sora, the Dutchman van Dongen and the Dane Ludvig Varming searched the coast of Nordaustlandet. Varming was left behind, but Sora and van Dongen reached Foyn Island and Broch island. Floatplane monoplane Hansa-Brandenburg W.33 "F.36" pilot: Lützow-Holm. Floatplane monoplane Hansa-Brandenburg W.33 "F.38" pilot: Riiser-Larsen. Floatplane biplane Sopwith Baby "F.100" pilot: Lambrecht (on board Tordenskjold). Floatplane biplane Sopwith Baby "F.102" pilot: Ingebrigtsen (on board Tordenskjold). Coastal defense ship HNoMS Tordenskjold, and seal fishery vessels Hobby (used thrice, see Italy and USA), Braganza (used twice, see Italy). Veslekari (Tryggve Gran), Heimland,fishery inspection vessel Michael Sars, Svalbard governor’s Svalbard and miner’s boat (name unknown). Dog sledge team led by the trapper Hilmar Nøis and Rolf S. Tandberg supported partly by two Italian alpine students Albertini and Matteoda. Floatplane / ski monoplane Junkers G 23 Red Bear (on board Krasin) pilot: Boris Chukhnovsky. Floatplane / ski monoplane Junkers F 13 RR-DAS pilot: Babushkin (on board Malygin). Ski monoplane Junkers F 13 RR-??? (on board Sedov, but never used). Icebreakers Krasin, Malygin, Sedov and brig Perseus. Floatplane monoplane Hansa Brandenburg (Heinkel HE 5) "255" pilot: Tornberg. Floatplane monoplane Hansa Brandenburg (Heinkel HE 5) "257" pilot: Jacobsson. Ski biplane Fokker C.V.M. "31" pilot: Einar Lundborg. Ski biplane Fokker C.V.M. "32" (never used, in the hold of Tanja). Floatplane / ski biplane de Havilland 60 Moth S-AABN pilot: Schyberg. Ski monoplane Klemm-Daimler L.20 D-1357 (from Germany) pilot: Ekman. Floatplane monoplane Junkers G 24 Uppland S-AABG (from national airline ABA) pilot: Viktor Nilsson. Seal fishery vessel Quest and freighter S/S Tanja. Seal fishery vessel Hobby with "F.36" and "F.38" pilots: Lützow-Holm and Riiser-Larsen (Louise Boyd charter). The causes of the crash remain controversial even today. The main causes were the severe Arctic climate and the decision to head back to base in the teeth of a worsening gale, rather than continue across the Pole to attempt a landing in Canada. This fact drove meteorologist Finn Malmgren to attempt suicide twice soon after the crash. Another factor is the decision to let the airship rise above the cloud layer, causing heating and then expansion of the hydrogen, which triggered automatic valving of the gas. Once the engines were restarted, the ship dived through the cloud into freezing air again and, either because the automatic valves were jammed open, or because the ship had already lost too much gas above the clouds, it could no longer stay aloft. Although Umberto Nobile was the victim of a smear campaign after the crash, one criticism of him, from the master airship pilot Hugo Eckener is perhaps justified—that Nobile should never have climbed above the cloud layer in the first place. Another possibility is a rupture of one of the gas cells, although it is difficult to understand why this would not have been noticed immediately by any of the crew on duty. The most recent theory suggests that the outer shell of the airship was damaged during the pre-flight ice removal, when a group of men wearing ice cleats hacked at the airship with pickaxes. Felice Trojani, one of the airship engineers, reported in his book that in the years after the crash, he examined eleven different possible causes in detail without coming to any real solution. Recent analysis of the historical evidence shows that human fatigue probably played an important role in the crash. At the time of the crash Nobile may have been awake for at least 72 h. Just before the crash, Nobile made three command errors of types associated with inadequate sleep. Sleep deprivation impairs aspects of cognitive functioning necessary for commanding flights, especially under such challenging conditions. 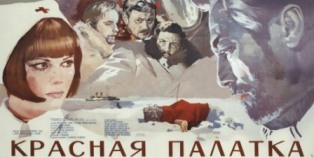 The 1928 Soviet documentary film Heroic Deed Among the Ice, by Georgi Vasilyev and Sergei Vasilyev, describes the rescue mission of the Soviet icebreaker Krasin. František Běhounek wrote several books depicting the events, including Trosečníci na kře ledové (translation: Survivors on cold ice) (1928). He was also advisor for the 1968 Czechoslovak documentary film, Vzducholodí k severnímu pólu (translation: Airship to the Northern Pole). The story of the Italia disaster was made into a film in 1969, titled The Red Tent. Midnight Sun is a 2007 graphic novel by Ben Towle, which tells a semi-fictionalised account of the rescue mission. The Spitsbergen Airship Museum in Longyearbyen, Svalbard, features many objects from the Italia, and attempts to portray the events of the expedition and subsequent rescue efforts in a neutral tone. ^ Commissione d'indagine per la spedizione dell'aeronave Italia, Relazione, in Rivista Marittima, Gennaio 1930, Ministero della Marina, p. 85 and segg. ^ Bendrick, Gregg A.; et al. (2016). "Human fatigue and the crash of the airship Italia". Polar Research. 35. doi:10.3402/polar.v35.27105. ^ "Nanuq searches for Airship ITALIA | POLARQUEST 2018". POLARQUEST 2018. 13 August 2018. Retrieved 23 August 2018. ^ "Dispatch from Nanuq: in search of the lost airship | POLARQUEST 2018". POLARQUEST 2018. 14 August 2018. Retrieved 23 August 2018. ^ "Vzducholodí k severnímu pólu". IMDb (in Czech). Retrieved 25 August 2018. Cameron, Garth. Umberto Nobile and the Arctic Search for the Airship Italia (Stroud, Fonthill Media, 2017). Wikimedia Commons has media related to Italia (airship). Umberto Nobile was an Italian aviator, aeronautical engineer and Arctic explorer. Nobile was a developer and promoter of semi-rigid airships during the period between the two World Wars. He is primarily remembered for designing and piloting the airship Norge, which may have been the first aircraft to reach the North Pole, and which was indisputably the first to fly across the polar ice cap from Europe to America. Nobile also designed and flew the Italia, a second polar airship; this second expedition ended in a deadly crash and provoked an international rescue effort. SSSR-V6 OSOAVIAKhIM was a semi-rigid airship designed by the Italian engineer and airship designer Umberto Nobile and constructed as a part of the Soviet airship program. The airship was named after the Soviet organisation OSOAVIAKhIM. V6 was the largest airship built in the Soviet Union and one of the most successful. In October 1937, it set a new world record for airship endurance of 130 hours 27 minutes under command of Ivan Pankow, beating the previous record by the German airship Graf Zeppelin. The AUT.18 was a prototype fighter aircraft developed in Italy by Aeronautica Umbra shortly before the outbreak of World War II. It was designed in 1934 by Ing Felice Trojani, who at that time was collaborating with Umberto Nobile on the Arctic flights of the airships Norge and Italia. The aircraft's designation came from initials of the manufacturer, the surname of the designer, and the aircraft's wing area, the sole prototype receiving the serial no. M.M.363. The Red Tent is a joint Soviet/Italian 1969 film directed by Mikhail Kalatozov. The Latham 47, or Latham R3B4 in Naval service was a French twin-engine flying boat designed and built by Société Latham & Cie for the French Navy. The aircraft achieved notoriety in 1928 when aircraft number 47.02 disappeared with the explorer Roald Amundsen on a rescue mission for the Italian explorer Umberto Nobile. Finn Adolf Erik Johan Malmgren was a Swedish meteorologist and Arctic explorer. Aldo Pontremoli was an Italian physicist who held a chair of theoretical physics at the University of Milan from 1926 and who founded and directed the Institute of Advanced Physics at the University of Milan from 1924 until his disappearance and presumed death in May 1928. Pontremoli was one of the six men who disappeared with the airborne envelope of the airship Italia after it had crashed on the Arctic ice on 25 May 1928. Boris Grigoryevich Chukhnovsky was a Russian and Soviet pilot and Arctic explorer. He participation in the rescue of the Airship Italia in 1928 and in the search of the Sigizmund Levanevsky airplane in 1937-1938. He also created, together with Robert Bartini, a dedicated airplane for Arctic research. The Spitsbergen Airship Museum is a museum located on the island of Spitsbergen in Longyearbyen, the capital of the Arctic Ocean archipelago Svalbard. It has been formally renamed as the North Pole Expedition Museum. It was co-founded by the Italian Stefano Poli and the Norwegian Ingunn Løyning. Plans to open the museum began in 2005. Originally a new building was supposed to be built to house the museum, but following a fallout with one of the share-owners in 2007 this idea was scrapped, and instead the Airship Museum was opened in 2008 in Longyearbyen's former pig farm, which previously had housed the Svalbard Museum as well. The Dirigibile Italia Arctic station is an Italian research station in Ny-Ålesund, Svalbard, Norway. Stefano Cagna was an Italian aviator, a Brigadier General of the Italian Royal Air Force, he fought in World War II and was decorated with the gold medal for valour in memory. Renato Alessandrini was an Italian explorer, perished during the polar expedition of the airship Italia.